Oxfam Trailtrekkers – the Big Walk is almost upon us! After months of planning, preparation and training, the big day is almost upon us. According to the Oxfam Trailtrekkers guide, this last week should be about ‘tapering’, resting and ‘carbing up’. With weekends of stomping out 20-30km practice walks behind me, I’m personally looking forward to a few days of guilt-free plates of pasta and lots of sleep! The other thing we need to focus on at this stage is our mindset. As many wise counsellors have advised us, if we don’t complete the full 100km it’s not a failure, as long as we’ve done our collective best. Yet we also want to give ourselves the best possible chance of success, and would really love to finish this thing. The guidance I was given by Juan Coto, a former international-level tennis player with an expertise in sports psychology is to have our reasons and drivers for tackling this challenge very clearly at the forefront of our minds. And while everyone on the team, walkers and support crew alike, has their own individual goals, we are all motivated by the statistics just released by Oxfam. These show that so far this year’s Trailtrekker event has raised £170k. To put this in context, £160k funds a project in Sri Lanka for a year, benefiting 10,000 people who are trying to recover from the devastating conflict which destroyed much of the infrastructure. ‘What’s a few blisters compared to that?’ as fellow walker Linda put it. The thought of the people we’re helping will really spur us on to keep putting one foot after the other when our legs begin to protest and our bodies start to desperately crave sleep. We’ve committed to raising £10,000 and are doing brilliantly so far, with the current total for our Alliance Yompers team standing at nearly £6500. We really appreciate all the donations and messages of support we’ve received from family, friends, clients and colleagues. There’s still plenty of time to donate if you’d like to! Just visit our Just Giving page here. Oxfam Trailtrekkers – the build up to the big walk! The Oxfam Trailtrekkers event, a formidable 100km walk in the Yorkshire Dales, is almost upon us. Our Alliance Yompers team, both walkers and support crew, is gearing up for the big day. 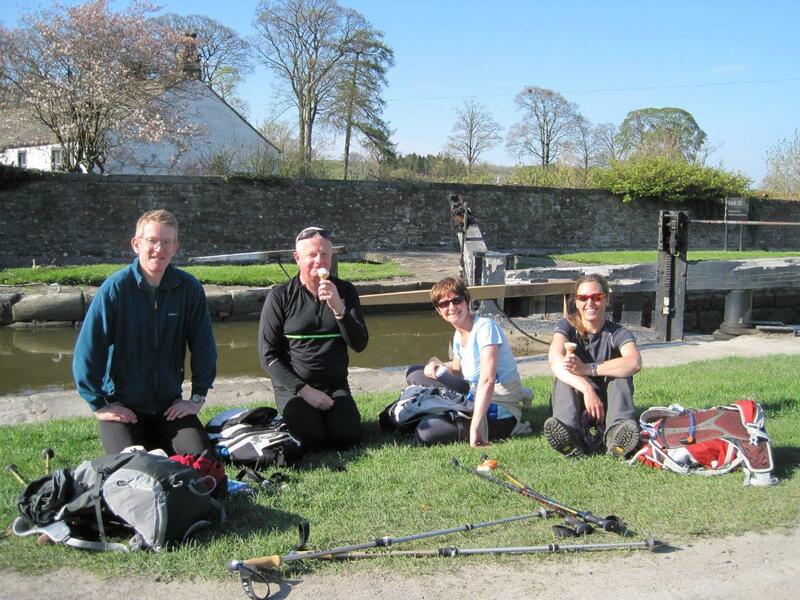 Linda F, the initiator of this huge adventure, Daniel, David and myself have been out pounding various pavements, country roads, hills and canal paths in an effort to accustom our bodies to the rigours of extended periods of walking. An equal part of the team is the support crew, who have been a massive help already and who will be invaluable on the day. We know our nutritional needs will be well-catered for and have been feeding in our personal preferences on the food we think will get us through. We’ve been helped by advice on everything from our kit to getting our feet event-ready. And it’s an enormous relief for the walkers to know that we’ll be greeted regularly by people who are willing us to succeed and will do everything they can to make sure we do. I’d persuaded myself that my recent trek to Everest Base Camp was good preparation, but the daily distances I covered in Nepal pale into insignificance in comparison to the daunting challenge that lies ahead. Most of our training so far has been as individuals, with various partners, friends and relatives co-opted in as occasional companions. Then last week, the walking team converged on Skipton station for a group walk on the course itself. After a requisite period of ‘faffing’ with our kit in the car park, we were ready for the off. Walking poles poised, we basked in the surprising bank holiday sunshine before striding off along the tow path just across from the station, at the foot of Aireville Park, which will also be our starting point on the big day. The canal was flat and calm, with clumps of brightly painted barges, lush greenery drooping over its banks, and perky birdsong illuminating the warm, sunbrushed air. At the outset our feelings were a cocktail of apprehension, anticipation and excitement, with the former soon subdued as we eased into our stride and began to enjoy the exercise, the scenery and the company. Five miles in, we left the canalside behind and struck uphill to join the Pennine Way across gently sloping hills bristling with fresh spring green. Out in the open fields, we wrestled momentarily with our map reading skills, but soon we were back on track and dropping down into the Aire valley to wend our way to Airton, a picturesque village with banks of glowing yellow daffodils. Bang on cue we were directed to a perfect farm shop for lunch where we calmed our surging appetites – I even managed to get hold of a skinny latte for a quick caffeine fix! With a fixed train time bearing down on us, our return walk was purposeful, but we made sure it included an essential ice cream break on the edge of the canal at Gargrave. Daniel had to contend with blistered feet for the last eight or nine miles, making for an extremely painful endeavour, and Skipton station was a welcome sight for all of us. It felt good to have walked together to establish our communal pace, and reassuring to have previewed some of the territory we’ll be tackling. We all seem to have shifted our mindset about what is a long walk. Linda, for instance, described having ‘nipped out for a quick 10 miler’ as though it were an insignificant distance. Nonetheless, we’re not underestimating the magnitude of what we’ve taken on. As Daniel and I relaxed on the train back to London, we found ourselves glancing out of the window into the inky darkness and wryly remarking that on the big day we’d still be walking. I couldn’t help the same thought popping into my head when I woke up the next morning after a heavy, restorative sleep that I’d sunk impatiently into and that we won’t be having the benefit of during Trailtrekkers! This is set to be an exhausting undertaking for all concerned and I’m sure we’ve all had moments where we wonder if we’ve bitten off more than we can chew. But I can’t think of a better team to make the attempt with and it couldn’t be for a better cause. The encouragement we’ve had from family, friends and colleagues has also been exceptional, and much appreciated. We’ve entered the walk as Platinum fundraisers, which means we are aiming to raise at least £10,000 for Oxfam, our Alliance charity of the year for 2013, so if you can help us reach our goal by making a donation, that would be wonderful. Our JustGiving page is here and you can see more information about Trailtrekkers here.